Andy Mungenast was born on August 13, 1924, in St. Louis, Missouri. He enlisted in the U.S. Army Air Corps Enlisted Reserve on September 23, 1942, and attended flight training at Kratz Field, Missouri, with the War Training Service while attending Jefferson College in Hillsboro, Missouri, from September 1942 until he went on active duty beginning on July 27, 1943. Pvt Mungenast attended basic training at Jefferson Barracks, Missouri, from July to October 1943, and then trained with the College Training Detachment at the University of Arkansas from October 1943 to February 1944. He entered the Aviation Cadet Program of the U.S. Army Air Forces on March 14, 1944, and was commissioned a 2d Lt and awarded his pilot wings at the San Antonio Aviation Cadet Center in San Antonio, Texas, on February 1, 1945. Lt Mungenast next attended pilot continuation training at Brooks Field, Texas, from February to July 1945, and then B-17 Flying Fortress transition training at Hendricks Field, Florida, from July to October 1945. With the end of World War II while he was in combat crew training, Lt Mungenast was assigned to additional continuation training at Hendricks Field and then at Columbus Army Air Field, Mississippi, from November 1945 to January 1946. His next assignment was as a Recruiting and Induction Officer at Columbus Army Air Field from January to July 1946, followed by service as a Vehicle Maintenance Officer with the 11th Maintenance Squadron in Japan from September 1946 to December 1947, with the 931st Engineering Aviation Group in Japan from January to July 1948, and with the 839th Engineering Aviation Battalion in Japan from July to August 1948. Captain Mungenast next served as Commanding Officer of the 3351st Training Squadron at Chanute AFB, Illinois, from November 1948 to November 1950, and then with the 3350th Student Squadron at Chanute AFB from December 1950 to August 1951. He served as an Aircraft Maintenance Officer in West Germany from October 1951 to May 1952, and then as an Aircraft Maintenance Officer and Section Chief with Headquarters U.S. Air Forces in Europe at Wiesbaden, West Germany, from July 1952 to February 1954. His next assignment was as an Aircraft Maintenance Officer with Headquarters, Air Material Force Europe at Wiesbaden from March to October 1954, followed by service as Assistant Chief of the Miscellaneous Aircraft Branch, Maintenance Division, with Headquarters Air Defense Command (ADC) at Ent AFB, Colorado, from October 1954 to May 1956. Major Mungenast served as a Maintenance Officer with the Support Aircraft Branch in the Maintenance Engineer Division at Headquarters ADC from June 1956 to September 1958, and then as Chief of the Propulsion Branch with Headquarters ADC from September 1958 to June 1959. His next assignment was as Royal Canadian Air Force Exchange Officer at RCAF Station St. Hubert in Quebec, Canada, from June 1959 to August 1962, followed by service as Chief of the Maintenance Reports and Analysis Branch at Headquarters ADC at Ent AFB from August 1962 to June 1965. During this time, Col Mungenast attended Southern Colorado State College in Pueblo, Colorado, to complete his bachelor's degree under an Operation Bootstrap assignment. He then served as Chief of the Research and Data Automation Branch with Headquarters ADC from June to August 1965, and attended Air War College at Maxwell AFB, Alabama, from August 1965 to June 1966. 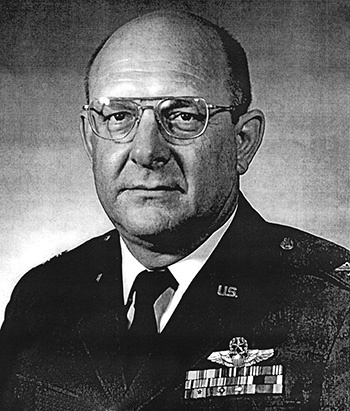 Col Mungenast then remained on the faculty at Air War College, and served as Director of Research and Development there from June 1966 to January 1967, and as a Political Military Affairs Officer from January to July 1967. He served as Assistant Chief of the Department of Science Technology and Systems Analysis at Air War College from July 1967 to September 1968, followed by service as Chief of Economic Studies and Assistant Chief of the Department of Science, Technology and Systems Management from September 1968 to June 1969. Col Mungenast served as Chief of the Department of Science, Technology and Systems Management from June 1969 to February 1970, and he was Tenure Associate Professor of Economics at Air War College from February 1970 until his retirement from the Air Force on September 1, 1973. Andy Mungenast remained active in aviation after his retirement from the Air Force, and he was awarded one of Alabama's first FAA Wright Brother Master Pilot Awards in 2005, which requires the pilot to have a minimum of 50 years of consecutive flying activity. Andy Mungenast died on April 25, 2009, and was buried at Arlington National Cemetery. His wife, Norma Rose Fahey Mungenast (1925-2015) is buried with him. Major Andrew J. Mungenast distinguished himself by meritorious service during the period 6 October 1954 to 31 March 1959 as the Air Defense Command Jet Engine Field Maintenance Project Officer and as Chief of the Propulsion Branch, Headquarters Air Defense Command. Major Mungenast made significant contributions to jet engine field maintenance planning and support effectiveness. His actions have resulted in an increase of necessary maintenance facilities and resources and a more dynamic system of maintaining first-line aircraft of the Air Defense Command, thereby furthering the security interests of the United States. By these acts and through his complete devotion to duty, Major Mungenast has reflected great credit upon himself, the Air Defense Command and the Untied States Air Force.